This blog is meant to take you on a journey beyond burritos but how could I deprive you of a free burrito. Today Only September 1st, Baja Fresh is giving away free burritos (with the purchase of a large drink). Become a facebook fan of Baja Fresh and get your free burrito. Hidden jewels are hard to find and most people will never have the opportunity to taste some of the real latin flavors that are primarily visited by first generation latinos. Thankfully there are bloggers that dare to explore as did Sarah DiGregorio from the village voice. 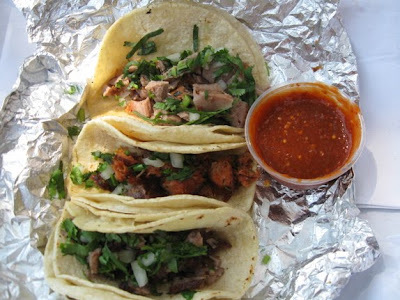 The tacos above are tongue, suadero(beef) and chorizo. Sarah, beyond burritos thanks you for discovering these savory looking and super affordable tacos. Read the post on Village Voice's Blog, Fork in the Road. Several months ago we visited Macondo, a place that brings together all the best Latin street foods on a very unique menu. Since then, it has been our goal to take the journey a few blocks down to Rayuela (165 allen st. b/t rivington and stanton/ 212-253-8840). Rayuela and Macondo have two things in common, the owners and the fact that they are both named after the novels of renowned South American writers. While a little pricier and more upscale, Rayuela introduces Estilo Libre Latino (Freestyle Latino), which respects yet redefines traditional Latin American and Spanish dishes. We were very excited to experience exactly what this meant, and thanks to the economy, we were able to take advantage of a super extended restaurant week (now extended through labor day). To start off, we ordered a classic. Though the journey beyond burritos is meant to explore the less common Latin food elements, we could never avoid the guacamole; especially when the guacamole is mixed with fresh crab meat, a gratifying start! Next, our heavenly appetizers arrived. The albondigas de cordero (lamb meatballs) were tender and juicy. With each bite, I scooped up some sprinkled bacon bits, asparagus and the delicious truffle-tetilla sauce. It's quite frustrating that licking your plate is not acceptable in this type of social setting. As usual Jaquie and I split everything, starting with the carica tejada (chilean papaya stuffed with duck confit). I discovered chilean papaya at pomaire, NYC's only Chilean restaurant. As I mentioned in pomaire's post, chilean papaya tastes like what a super refined canned mango/peach would taste like if it existed. I say canned only because it has the same texture but less sweet and without the syrup. The combination of the shredded, moist duck meat and the papaya made for a memorable creation. The Entrees arrived at the perfect time as our appetizers had settled in our bellies and our cocktails were nearing an end. My fork naturally dove towards the crispy skin of the Chilean sea bass. The fish was perfectly cooked with the skin crisped up separately and set on top. We both feel that crispy skin should be served like this everywhere. Jaquie's exact words were "This might be my favorite seafood dish ever!" Enough said. The roast pork was similar to pork I have tasted at several Latin eateries and alone was tasty but somewhat average. Yet when the pork was combined with the mole, mashed potatoes and goat cheese, its richness was revealed. We ended with a couple of desserts. I added the molten lava cake picture because it looks amazing. It probably would have been amazing if the inside had actually been molten. I'm assuming that it was not prepared correctly. The crema de requeson (cheese custard with olive compote and basil mousse) was another story. We were only going to share one dessert but our waiter, who was from my hometown of Manizales, insisted that we try this courtesy of him. We thanked him like five times for introducing us to this wonderful treat. I had no words to describe it but Jaquie says it’s like cheesecake custard on crack with a little surprise at the bottom. And she was pretty excited that she got to try a dessert that encompassed basil as she had recently seen this on Bravo TV's Top Chef Masters (click here for the recipe). All in all, a great restaurant with a truly unique vision on all Latin ingredients. The growth of Latinos in the US has marketers scrambling to better serve this demographic. What this says for the Latin food world is.... more Latin food stores with a wider selection of products from all Latin American countries. Now the king of retail, Wal-Mart Stores Inc. has opened a Sam's club style superstore called Mas Club. The new subsidiary offers products that are more familiar to Houston's increasing population of Mexican immigrants (1/3 of Houston's population). The new store is a test and if profitable could expand across the US to other densely populated Latin American neighborhoods. The great thing is that this opens the doors to a larger amount of Latin American food suppliers creating a greater diversity of our Latin food options. Ask and you shall recieve. I secretly pray to the food gods, asking for diversity in New York City's street food in particular tacos. There are a few taco trucks in the five burroughs but the grand majority of the street food is still heavily dominated by halal meat. I personally enjoy some chicken and lamb over rice with extra white sauce and hot sauce but as a Latin Foodie, this city is lacking some quality tacos. My wishes are not exactly answered yet but the expansion of a generic taco franchise is certainly a step in the right direction. In comes The Taco Maker (very straight forward). TTM is the largest quick service Mexican restaurant franchise in Puerto Rico and is quickly expanding across the US. 40 stores are set to open in Manhattan in the next 10 years. TTM, We welcome you with open appettites. Starting today, I will no longer have 'today's latin food blurb' on the right side and will eliminate the 'random recipe of the day' until I can better organize the recipes. Instead I will be posting regular posts and tagging it 'Latin Food Blurbs'. This way you will see more posts and you can comment on the blurbs.